This facility was established in the Fishing Harbour, Thoothukudi It was initially established under Dept. of Ocean Development, New Delhi research project entitled, “Mariculture of Spiny Lobster” during 1991 – 1994 with a plinth area of about 2,500 sq. ft. Subsequently the facility was strengthened under two projects funded by ICAR, New Delhi and Ministry of Environment and Forests, New Delhi during 1996-99 and 2005 -08 respectively. Currently eight cement cistern and 10 FRP tanks with sufficient infrastructure are available for research.This facility was used for rearing lobster, crab and other endangered marine fish species towards production of larvae for sea ranching. Later the facility was used for demonstration of lobster and crab fattening under NADP Scheme during 2011-12. Currently this research facility is being used for post-graduate student’s research purpose along with spiny lobster stock enhancement through sea ranching. This research facility is also involved in extension activities related to lobster conservation. Being in the middle of the Marine Bio-sphere Hot Spot this facility ample scope to take up research on breeding biology of marine food fishes by the Fisheries Resource Management students and staff. To facilitate P.G. students in their research work on growth and reproductive biology of marine species. To popularize culture and conservation of marine organisms. SRFF facility with seawater supply and aeration arrangement. Technology has been developed for indoor rearing for spiny lobsters. Over 5 million seed of lobster were sea ranched to enhance natural lobster production. 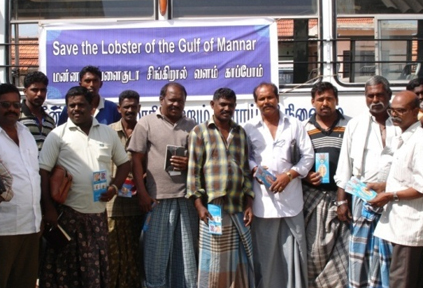 To standardise culture of Siganus species for mariculture.